The show opens with WWE remembering 9/11 by tolling the ring bell 11 times. Jeff Hardy is out first to kick off the show tonight in Lafayette. We see footage of Hardy taking out Randy Orton three weeks ago with a swanton bomb through a table. Back live, Hardy has a mic and talks about battling demons in his life and overcoming them. He stands before you a better man. Hardy says he faces his most venomous demon this Sunday at Hell in a Cell: Randy Orton. He says he is a daredevil and has no fear. A loud “DELETE” chant starts up. Hardy will unleash a lifetime of pain and suffering on Orton. 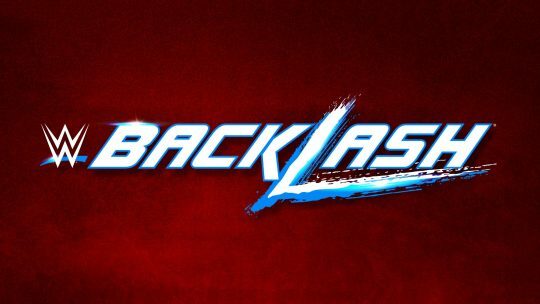 Tonight he focuses on Shinsuke Nakamura and tells everyone to enjoy the show. The bell rings and Nakamura immediately rolls out of the ring. Hardy with a kick and jawbreaker when Nakamura returns. Hardy dropkicks Nakamura out of the ring and then jumps out catching Nakamura with a shot. Hardy launches Nakamura into the barricade, backs up, runs, jumps off the steps and catches Nakamura with a splash. After commercials, Hardy is back in the ring with Nakamura and tosses him face first into the corner. Hardy does this repeatedly in other corners. Nakamura gets in some offense dropping Hardy and getting in a few kicks. Nakamura with a headlock that drops Hardy to one knee. Nakamura throws big knees into the ribs of Hardy to bring him back down. Hardy attempts a comeback, but eats a big spin kick from Nakamura sending him to the corner. Hardy with a sling blade when Nakamura tries to charge in. Nakamura lands a knee countering a suplex attempt. Hardy catches Nakamura with an elbow and Whisper in the Wind combo. Nakamura with a series of shots that knock Hardy off the top turnbuckle. After commercials, Hardy has Nakamura down inside the ring and hits his leg drop low blow and dropkick combo for a two count off a pinfall attempt. Nakamura catches Hardy with a kick to the back of the head and uses the bottom rope to bounce Hardy’s head with his boot. Nakamura with a running knee to the side of Hardy’s face on the ring apron. Nakamura is fired up in the corner. Nakamura charges and Hardy counters with a roll up for a moment. 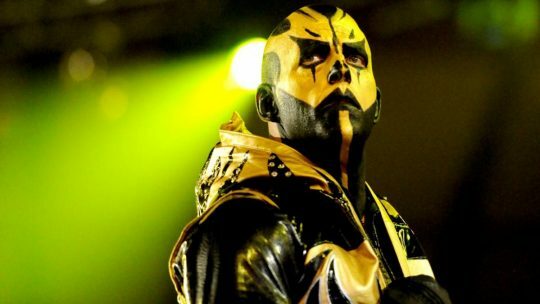 Hardy connects with Twist of Fate and heads up to the top turnbuckle. Hardy is just starting to stand up on the top turnbuckle when Randy Orton shows up and knocks Hardy off. The referee immediately calls for the bell. After the match, Orton bounces the head of Hardy against the steel steps. Orton tosses Hardy back inside the ring and grabs a steel chair. Orton cracks the chair over the back of Hardy. 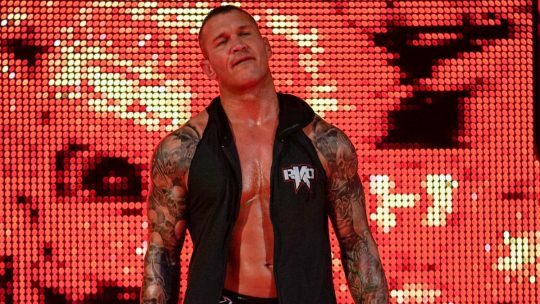 Orton his Hardy in the ribs and a shot over the back with the chair again. Orton is calling for an RKO. Hardy counters, misses a Twist of Fate and Hardy hits Orton repeatedly with the steel chair over the back. Hardy with a Twist of Fate on Orton. Hardy starts going up to the top turnbuckle and connects with a Swanton Bomb over Orton. Backstage, The Miz says his wife Maryse is taking the spotlight. She will have her first singles match in WWE in 7 years tonight against Brie Bella. Maryse says it took Daniel Bryan 3 years to come back in the ring and only her a few months after giving birth. She is ready to make her husband proud and show her daughter how to punch Brie in the face. Miz insults the marriage of Brie and Daniel Bryan. We go to video earlier today of WWE Champion AJ Styles sitting at ringside. AJ Styles says Samoa Joe understand his biggest weakness is his temper. Styles talks about Joe bringing his family into this situation. He says Joe must think if he can attack my heart then he will get the advantage. Styles says Joe might be right, but after 20 years of friendship, he knows a lot about Joe as well. He says Joe has a family and the difference is he would never mess with one. Styles says Joe’s biggest strength is running his mouth and intimidation. He adds that Joe is a real piece of…garbage. Styles says that will be his weakness when the bell rings. “No one has the upper hand on AJ Styles. At Hell in a Cell, the talking stops. 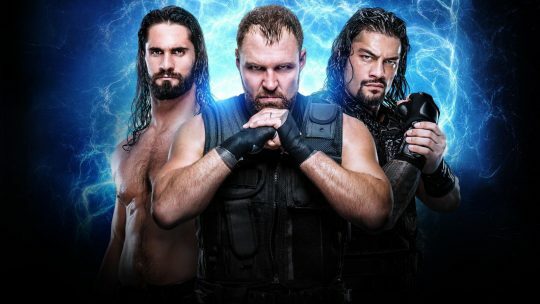 The intimidation ends.” He says Joe got a dose of what happens when you talk about his family at SummerSlam and he gave him another taste last week. Styles says in five days he is going to show Joe just how phenomenal he is. He reminds Joes that this is the house that AJ Styles built. “And it’s not for rent and it damn sure isn’t for sale.” Commentary talks about the title match this Sunday. 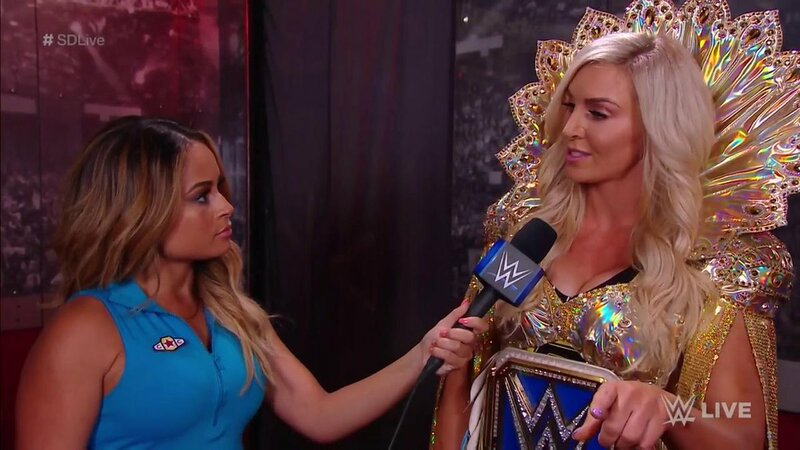 Backstage, Smackdown Women’s Champion Charlotte Flair talks about requesting a match against Sonya Deville. 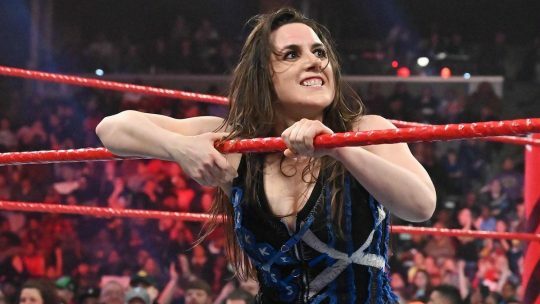 She thrives on competition and unlike Becky Lynch, she goes out there and proves it. Charlotte says Becky is going to learn this Sunday that it is way easier to talk the talk instead of walk the walk. Sonya and Charlotte grapple early in the match. More counters including off a bridge by Sonya. Sonya with big knees to Charlotte in the corner. Sonya catches Charlotte with a big knee to the face and gets a two count off a pinfall attempt. Charlotte responds with a big boot. Sonya rolls out of the ring to regain her composure. After commercials, Charlotte catches Sonya with a belly-to-back suplex. Sonya with big rights. Charlotte fires back with chops. Charlotte goes for a moonsault off the top rope, but Sonya gets her knees up and plants Charlotte with a quick spinebuster for a two count. Sonya pulls guard on Charlotte going for a triangle choke. Charlotte powers Sonya up, tries to bounce her off the top rope, Sonya slides off the top rope, Charlotte hangs on and powerbombs Sonya down. Charlotte gets the Figure Eight locked in. Sonya taps out. After the match, Charlotte goes to celebrate her win with fans at ringside when Becky Lynch (in disguise) attacks her from the audience. Becky jumps over the barricade and locks on her armbar attacking Charlotte at the end of the ramp. We hear from Samoa Joe, who has a bedtime story about a hero and a villain. Joe reads a book called “Night Night AJ” by Samoa Joe. The story talks about a man building a house and defending that house against all. It continues profiling a “child being frightened” at SummerSlam at what she had to witness. The story talks about the battle lines being drawn at Hell in a Cell. It ends with Joe holding the WWE Championship in a drawing with AJ Styles’ family embracing him. Backstage, Becky Lynch promises to break Charlotte’s arm, but will only do it when she takes back the Smackdown Women’s Championship. Smackdown Tag Team Champions The New Day are at ringside with their own announce table. Footage airs of Kofi Kingston wearing a blonde wig trying to interview The Bar. We are back live as Sheamus tags out to Cesaro who kicks Rusev and throws a big uppercut. Cesaro with a headlock on Rusev to keep him grounded. Tag to Sheamus who takes over the headlock on Rusev. Rusev with a boot to Sheamus, tags in Aiden English and English comes off the top rope with a cross body. English with a swinging neckbreaker to Sheamus, counters a back suplex and launches Sheamus over the top rope. Rusev gets tagged in and tosses Cesaro over the top rope. Rusev launches English over the top rope to take out The Bar at ringside. English has the tag and plants Sheamus with a DDT. Cesaro tries to grab English when Rusev gets involved. Sheamus with a big knee to English. Cesaro with an uppercut on English. Cesaro tags Sheamus back in. The Bar kicks English in the corner. Tag to Cesaro who gets in a kick and applies a headlock on English. After commercials, Cesaro and Rusev get the tags. Lana is now at ringside cheering on Rusev and English. Rusev with a corner charge and running spin kick that drops Cesaro. Cesaro avoids a kick, but eats a knee and kick to the head combo for a two count by Rusev. Rusev gets The Accolade applied on Cesaro. Sheamus breaks it up with a shot to the back. Sheamus is dumped out by Rusev. Cesaro with an uppercut to Rusev, tag to Sheamus and The Bar plant Rusev with a double DDT that results in a close two count. Rusev with a boot to Sheamus and sends Cesaro into the post. Rusev with a roll up for a two count. Sheamus plants Rusev with a scoop slam for another two count. Sheamus catches English with a Brogue Kick, pushing Rusev out of the way. Rusev with a superkick to Sheamus. Rusev covers Sheamus and picks up the pinfall victory tonight. After the match, we see a replay of Aiden English sacrificing himself to take the Brogue Kick from Sheamus to setup the win for Rusev. English and Rusev celebrate with Lana inside the ring and then trade words with The New Day at ringside. The New Day defends the Smackdown Tag Team Titles against Rusev and English at Hell in a Cell on Sunday. Carmella is at ringside with Truth, while Zelina Vega is at ringside with Almas. Almas with chops early to Truth near the corner. Truth with a hurricanrana takedown on Almas. Almas catches Truth with a kick to the head while flipping back. Truth counters a suplex attempt and drops Almas down face first on the mat. Truth with a splash on Almas in the corner, misses a scissor kick and Almas holds on using the ropes. Vega poses and smiles under him. Carmella pulls Vega out of the ring. Almas rolls up Truth for the win. After the match, we see Almas held on to the shorts of Truth to pick up the win. Backstage, Asuka is asked about her return last week and helping out Naomi. Naomi walks up and wants to know why. Asuka says The IIconics are mean. Naomi says Asuka is sassy and can feel the glow. Asuka thinks Naomi asked her to go. Naomi corrects her. Brie shoots in for a lock up early and Maryse bails out of the ring. Back inside, Maryse gets between the ropes to prevent another lock up by Brie. Maryse does her hair flip pose at Brie and then quickly jumps out of the ring again. Brie grabs a mic and says she always knew Maryse was a coward. Miz grabs a mic and asks if everyone thinks they are really cowards. He says Brie doesn’t even deserve to be in the same ring as Maryse. Miz says Maryse is out here five months after giving birth and how this city doesn’t deserve this match. 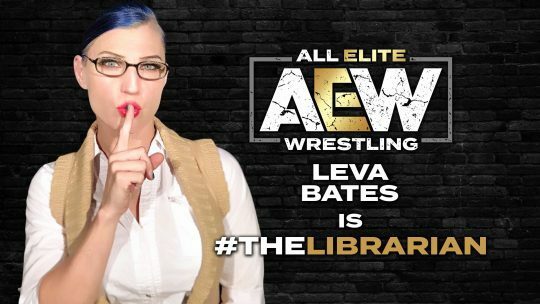 “This match, your little main event, is over. We will see you two at Hell in a Cell. Thank you.” Miz drops the mic and walks up the ramp with Maryse. The referee talks with Daniel Bryan and Brie. Brie jumps out and grabs Maryse. Brie tosses Maryse face first off the ring apron a few times at ringside. Brie tosses Maryse inside. Miz jumps up on the ring apron. Bryan walks up to make Miz back off. Maryse with a cheap shot kick to Brie that results in a close two count. Brie gets Maryse down in the Yes Lock. Miz grabs Brie and pulls her out of the ring. The referee calls for the bell. When the bell rings, Daniel Bryan jumps and takes out The Miz. Bryan continues to brawl with Miz back inside the ring. Bryan with right hands to Miz. Miz grabs Bryan and dumps him out of the ring through the ropes. Bryan catches Brie on his way down. Brie is holding her lower back. Bryan is yelling for help from the backstage area. Miz grabs Bryan and dumps him into the steps at ringside. Maryse with rights to Brie on the ground and then tosses her face first into the ring apron a few times. Brie tackles Maryse inside the ring and throws rights of her own. Miz is back in and backs down when Brie gets in his face. 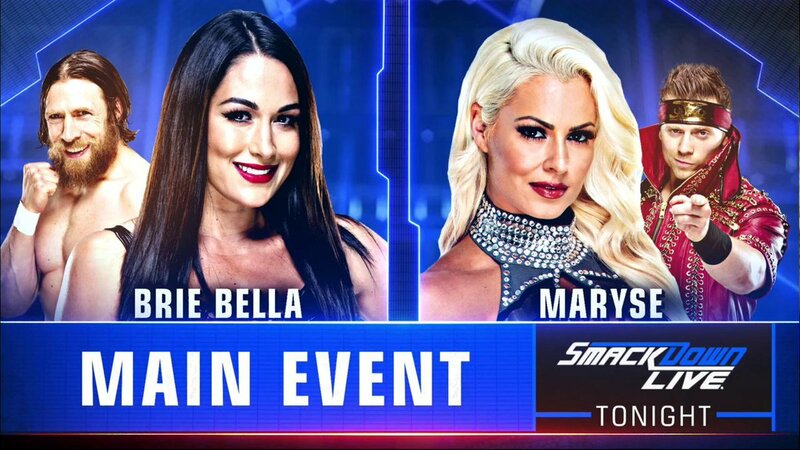 Maryse can’t land a DDT on Brie. Miz grabs Brie. Bryan breaks it up throwing Yes Kicks at Miz in the corner. Bryan yells at Miz to never touch his wife. Brie with a punch to Miz and Bryan clotheslines Miz over the top rope. Bryan fires up the crowd with a loud “YES” chant. We get a reminder that it will be Daniel Bryan and Brie Bella vs. The Miz and Maryse this Sunday at Hell in a Cell. The show comes to a close with Bryan and Brie celebrating.